Newsflash: I think I've found the perfect autumn/winter flat. There's nothing worse than freezing your tootsies off in flimsy ballet pumps when the temperature drops, which is why I think UGG Australia's range of sheepskin-lined flats is ingenious. 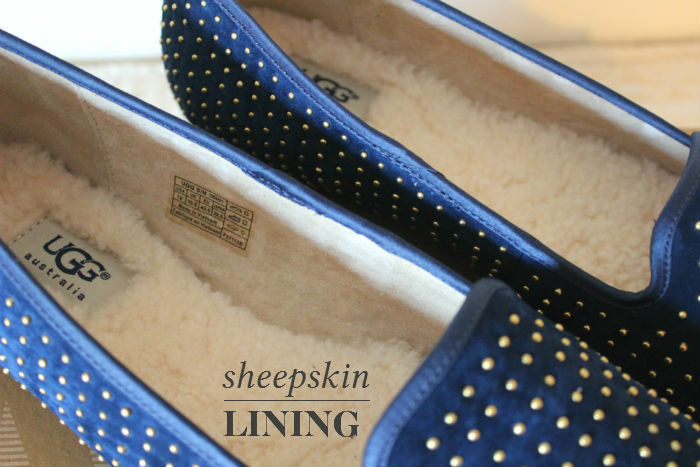 The brand have designed a selection of on-trend smoking slippers featuring signature sheepskin footbeds. 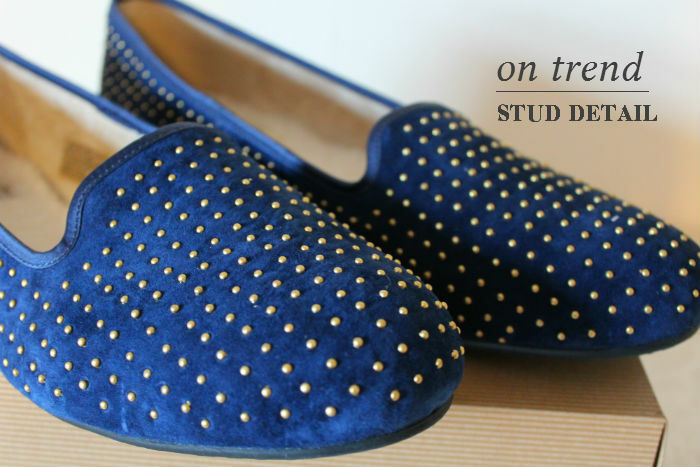 UGG Australia were kind enough to send me a pair to review - I selected the navy Alloway studded slippers (navy is one of my favourite colours to wear in winter.) All credit to UGG Australia- this is one beautiful pair of flats. They feel sturdy and wonderfully made, whilst the hardware detail add a high fashion edge. But the real selling point is the sheepskin lining - pillow-soft, like walking on a luxuriously fluffy carpet where ever you go. I'll be wearing mine colour blocked with denim and my navy coat once the autumnal chill sets in - will you be picking up a pair of UGG Australia slippers for winter? 1. Surface to Air navy Sabina coat, Avenue 32, £390. 2. Current/Elliot patched skinny jeans, The Outnet, £98.90. 3. Markus Lupfer loves Hillier squirrel sweater, Net-a-porter.com, £265. 4. Python embossed clutch, Banana Republic, £69.50. Hi I have nominated you for a Liebster Award visit my blog http://www.fashionnotesbycris.blogspot.co.uk to see the rules and answer your questions.